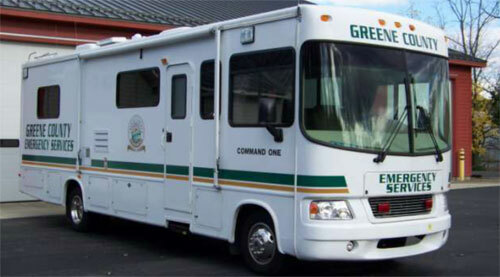 The mobile command post may be utilized by any emergency service or county agency in Greene County. It may also be sent to areas outside the county with approval from either the GCES Director, the County Administrator or when requested under state or federal disaster declarations. It is designed to be used at large scale and extended incidents. Some examples are mass casualty incidents, hazmat scenes, standby at mass gathering events, large scale and extended fire scenes, extended rescue scenes, extended police operations, etc.